Okie, as we near the end of the season we really should look at which teams are bound to make it all the way. I mean, we really should. But let’s take look at a team that shouldn’t even be talked about, but is trying to make a rumble. Specifically, 76ers. Winning four in a row yo, J.B. fills us in. What is up with that gang? Don’t you guys want top picks in da lottery? They’ll have are a hard time securing that spot since Hotlanta, Boston and Mumphis are better losers than they are (that makes him Winners!). But, I’m glad this his surge has been also good to Iggy, (good thing we checked up on him), ballin’ straight up this past month (20+ pts in almost all of them). It’s great that he’s building that momentum to become a greater player, and winning certainly helps. Why not?” is how Andre Iguodala would answer that. 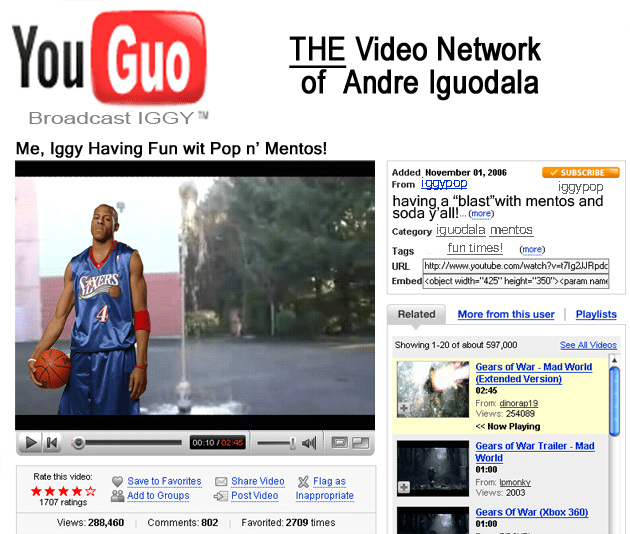 “Look at the Orlando Magic last year,” Iguodala said. “They were in a similar position. Nobody was looking at them and they sprouted up and finished ninth and surprised everybody. You never know. 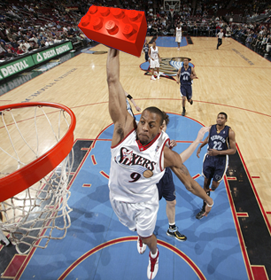 “It’s been the high point of the season so far,” Iguodala said. “I was at an autograph signing and this guy was saying, “You guys are playing well, and that’s good, but we’re not getting a lottery pick if you guys keep winning,’ ” Sixers forward Andre Iguodala said. Can’t knock A.Iv2.0 and his confidence and spirit though, even in a weird/bad year that his team went through. Good thing home town Philly-ers feel the same way, as a recent SLAM feature shows his popularity. Yao apparently is cleared to face the flippin casual Cavs tonight! And he’s going to be wearing an leg instrument! *I know it’s his right leg, but I think we all know Yao needed to balance the weight. I bet Zzzz is happy that Mr. Ming isn’t at full strength yet, and they’ll have their epic battle of the slow moving mountains tonight. But, a limping Yao trumps a normal Z any day. Advantage, Robocop leg. *this is probably fake… it’s what I imagine ‘Dre is up to these days..
For some reason a thought came in today out of nowhere (I know, weird): “hey, why the hell isn’t Andre Iguodala becoming a premier player already? ?” I’m not sure why I think he should be a premier player, but something inside (probably the kidney) is saying to me that this third year kid should and can have a Shawn Marion-esque career. But I really haven’t heard anything about Andre in a while—well, the major factor is that Philly isn’t exactly a bastion for media enthusiasm nowadays, with the losing and whatnot. Prince Really Did Make It (Purple) Rain! You Will Watch … Or Else! Grab your NBA seats right here.